See more objects with the tag transformation, game, gambling, gluttony. This is a Playing card. It was printed by Belin. It is dated late 19th century and we acquired it in 1955. Its medium is lithograph on paper. It is a part of the Drawings, Prints, and Graphic Design department. A group of transformation playing cards makes up this lucky poker hand. 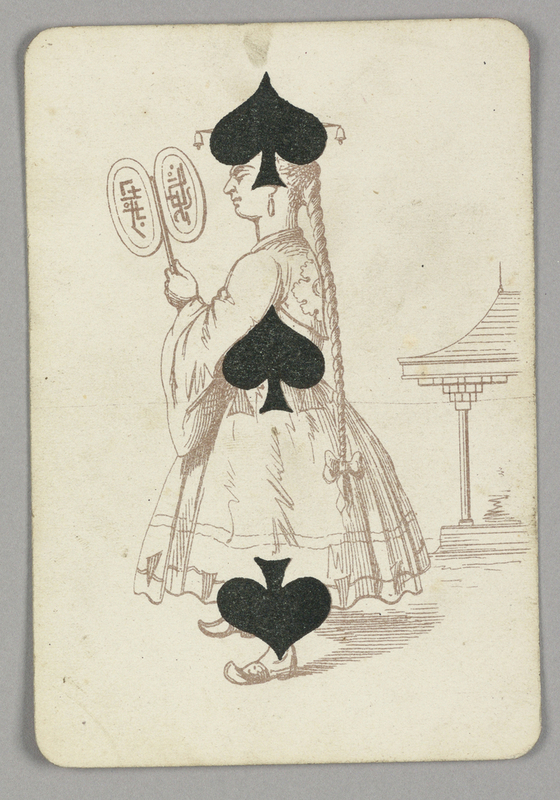 Each numeral card in this 19th-century deck bears a unique figural image that cleverly incorporates the quantity and symbol of the suit into the scene. Hearts, diamonds, spades, and clubs are here transformed into hats, boot cuffs, and vases, adding further amusement to gaming. This object was catalogued by Julie Pastor. It is credited Gift of Mrs. Dexter J. Purinton.